The issue with babies is we cannot watch over them 24 hours, especially for when they start to crawl and walk. That is why you need to install baby gates at home to make sure that they do not crawl out of the boundary you set for them or the safety zone. When choosing a high quality gate, usually, the taller the better in addition to considering the quality of the gate as well. Whilst shopping for a baby gate, many people gamble with untested brands or the low-quality ones. Indeed, with many options available, how do you decide which is the best one to buy? That said, our team has been putting a lot of efforts into choosing the top 10 best tall baby gates for you. Check them out below. Hang on tight, we are going to start our list with the Cumbor Auto Close Baby Gate. This tall safety gate is made of steel which is durable and sturdy that you can use it for a long time. The height of this tall baby gate is 32″ tall and also wide as well with the width of 29.5″ and 38.5″ and can also extend 2.75″ more. This gate also has a safety lock system as well to ensure the safety of your baby and make sure that they stay in the safety zone. This kind of gate is ideally fit to install in the hallway and wall cup included inside the same can protect your wall as well. Our next lovable baby gate on our list, we have the Safety 1st Tall & Wide Baby Gates. This is the tall indoor gate and is designed to be easy to open with only one hand for the parents and difficult for children to open. You can adjust the gate width to be wider which you can extend the length from 29″ to 47″ that is convenient for every parent out there. 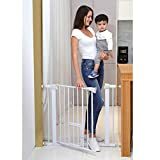 Moreover, this tall baby gate is super easy to install because it is equipped with the pressure-mounted that require no tools, drilling, or hardware. This tall indoor gate is a great option if you have a 1 or 2-year-old baby who just starts learning to walk. Moving on to the next tall baby gate here, we have the Safety 1st Extra Tall and Wide Gate. This tall indoor gate has been designed to deliver the additional height protection which is great for babies who start learning to walk or crawl. 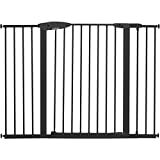 For the width of the gate, it is 29″ to 47″ wide to fit with any preferences or situation inside your house. This gate features pressure-mounting that require no drilling or tools that did not damage your wall. Moreover, this tall baby gate also has the SecureTech Pressure that alerts you at a glance whenever the gate’s pressure needs to be adjusted. Another recommendation on the best baby gate from us is the Regalo Extra Walk Thru Baby Gate. This tall baby gate has the height of 41″ tall and the width can be extended from 29″ to 38.5″ to fit with the preferences of the size of your hallway for convenient. With this height, it is ideally fit for those who have a baby who just start crawling or learning to walk. With this gate, the installation is super easy since it comes with the pressure-mounted feature that requires no drilling or tools which will damage your wall. At the same time, this tall baby gate is ideal for hallways or doorways since it allows you to extend the width 6″ wider. Coming up next, we have the superb Munchkin Easy Close Metal Baby Gate. 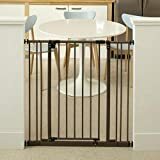 It is the tall baby gate with a height of 36″ tall and the width can be adjusted from 29.5″ to 51.6″ that make it ideal for the hallway or doorway. Installing this baby gate is a very easy task that requires no tools or drilling that will damage the wall since it features the pressure-fit for an additional safety and easy to install. On a side note, this baby gate equipped with the double-locking system that makes it hard for the baby to unlock the door while it is easy for the parents. Ranked in number 5 on our list, we have the Dreambaby Chelsea Auto Close Baby Gate. Best yet, this tall baby gate is made of metal which is hard and strong for better usage and long-lasting lifespan. At the same time, this gate equipped with the smart stay-open and auto-close feature that makes it more convenient especially for the busy parents that find this little thing make a lot of difference in their life. With the height of 39.5″ and the width can be adjusted from 38″-53″, it is the perfect fit for the hallway or doorway. 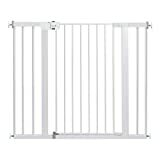 The next baby gate is Summer Infant Metal Expansion Gate. This tall indoor gate is constructed with metal which is tough and sturdy and best fit to use for many years to come. This gate has the securely mounted hardware that has been designed with 4 extensions for the extra wide open space. Moreover, it is 36″ tall with adjustable width from 44″ to 72″ wide. This tall indoor gate is designed with a care that it features the soft scratch on the bottom rail of the gate to prevent it from scratching the floor. For the design, it is very simple and you can open and close the door one-handed that make it super easy to use. Up next, we have the North State Extra-Tall Easy-Close Gate on the top third-rated on our list. It is designed to make it easier for parents to keep their child safe and secure with only one simple push. It also comes with the pressure-mounting feature that didn’t require tools or drilling to the wall while installing this gate and it will not damage your wall as well. This tall indoor gate features the bronze finish for exceptional richness and durability along with its heavy-duty steel construction will last for last. Plus, this baby gate can be swung open both directions for added convenience and the triple locking system will allow the parents to have peace of mind. 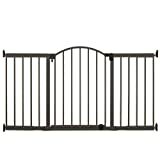 For an item landed on number 2 on our list, we have the Regalo Home Accent Walk Thru Baby Gate. This extra tall baby gate is 37″ high and the width can be expanded from 29″ to 43″ wide to fit with the hallway or wide doorway. Looking at the installation, this baby gate didn’t require drilling or tools to set it up since it comes with the pressure-mounting features that will not damage your beautiful wall. On a side note, this gate also designed with safety-lock that will keep the parent’s mind at peace and keep their children safe and secure. 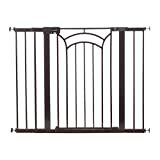 The last item on our list is the Summer Infant Deco Extra Tall Walk-Thru Gate. It is constructed from metal that is built to last for many years. The pressure-mounting installation of this gate will require no tools or any hard works and will make things easier for you. Plus, this tall baby gate also includes the optional hardware mounts equipment for stairway installation. This baby gate is 36″ high and the width can be expanded from 28.5″ to 45″ which is the ideal choice for a wide hallway or doorway. It has a dual locking system which will keep your child safe and secure. We have listed down the top best baby gates for you, and now it is time for you to decide which baby gate you want to go with. All of them are made of durable construction that is built to last. Their designs and look aren’t any less desirable either. Have you discovered your favorite baby gate yet? If yes, grab yours now.